Watermelon sake made with Otokoyama tokubetsu junmai. The recipes in The Lee Bros. Southern Cookbook have proven reliable over the past two years. Their jambalaya is great and the spiced pecans and the crab dip are on the menu tomorrow for the Fourth. I was astounded to see a recipe in the cookbook for peach sake (why? because apparently some form of “rice wine” was “a noted beverage in the Lowcountry in the nineteenth century”), and a variation suggested watermelon. I had a bottle of Otokoyama tokubetsu junmai which is nondescript enough to mix with fruit. The recipe is barely a recipe, steep fruit in sake, wait 24 hours. As a rule, I’m not interested in sake cocktails (although a concoction at Restaurant Eve was pleasant enough). 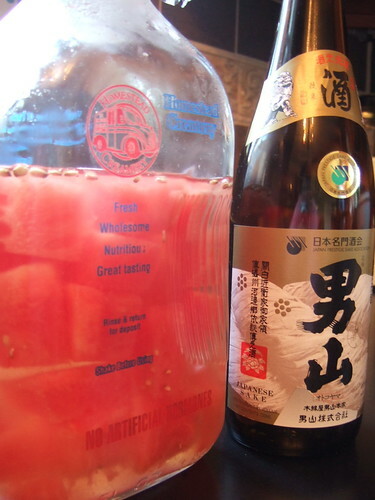 But what the hell, it’s July Fourth weekend and the strange combination of Japanese sake and American watermelon might just convert some friends who are skeptical about sake. The watermelon has been steeping 24 hours and it’s…watermelony sake. That certainly looks pretty refreshing, even for someone like me who isn’t a huge watermelon fan. Hope it was a hit on the Fourth. From what I’ve heard, anything cool would be a hit lately. Hard to picture that even Boston has been hotter than Tokyo recently. Suika sake sounds good, actually. Curious how you liked it. I hope you stayed cool with suika sake on 4th of July. The watermelon sake was a huge hit. One of our guests said he never liked sake before but he loved the suika sake. I usually don’t care for flavored sakes because they have an artificial, factory-fruit taste, but making it yourself at home results in something really lively. The fruit steeped in the sake a total of 48 hours before we drank it. I wouldn’t do it with a sake with a lot of character (yamahai/kimoto) or a daiginjo with a great nose. The clean dryness of the Otokoyama worked pretty well. My guests were digging it. I’m going to try it with peach next. Cantaloupe would be interesting, too, since there are often hints of it in good sakes. Oishii wa yo! It sounds so delicious!!! How did you serve the drink: in what kind of glasses? And did you strain it first or just pour in with the fruit, a la sangria? I strained it, the watermelon after 2 days of steeping had some squishy texture issues. Next time I might steep the watermelon, strain, and put fresh watermelon pieces in a glass. I served it in small summertime ochoko (small sake cups), mainly for the visual effect (I have a bunch of cute ochoko), but really anything would be fine. Most of the time I drink sake at home in a Riedel stemless white wine glass.